Strong coffee lover Jason loves siTigun at Nagore place. They roast Arabica on the site, and we buy beans from them. 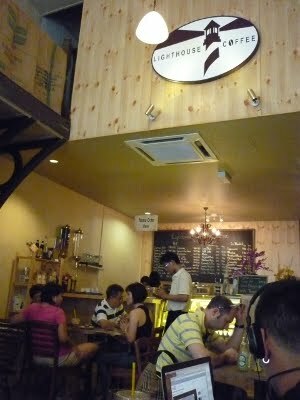 We went to Lighthouse Coffee at Logan Heritage, the newly renovated heritage building turned into a shopping mall near Little India, where Lynn recommended us to go. The cafe reminds me of Monmouth coffee in London. Probably Japanese prefer coffee here, not too strong but not too weak. I went there few days ago after seeing yr blog, wow I love their coffee. I buy 3 bags of beans and they are fresh and make good cappuccino on my machine.